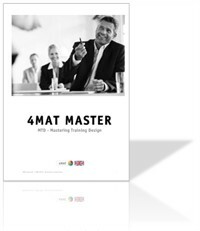 4MAT MTD - is an internationally recognized training programme used worldwide by people who work professionally with learning, development and management. 4MAT is a unique process model, based on a number of highly recognized theories about people development and learning. 4MAT is about the natural learning process and how you can create and/or optimize the learning and development environments. - 4MAT Master Concept - "Learning languages ​​4 at a Day"
Price pr. person: DKK 13.750, - excl. VAT. Call Hanne on (+45) 4040 3211 or write to hh@4mat.dk for more information.